If I’d had any buttons, I’d have burst them for sure. Last night at the 6×6 Art Auction our friend and neighbor’s oil painting went for the next-to-highest price. 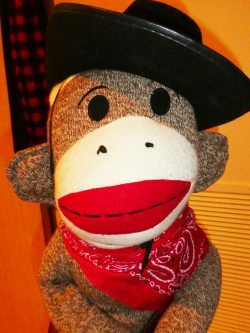 And, really, if you are at all familiar with the Columbia Pacific Heritage Museum’s annual fund-raiser, you know that the sock monkey painting (always submitted by Leslie Hall Lipe and always acquired by Karla Nelson and always fetching top dollar) is in a class by itself. There was a serious bidding war for Tucker’s painting. It came down to two people on opposite sides of the room and, unbeknownst to them during the bidding tumult, they actually know one another. In the end, it was Kenny Tam who took “Oysterville Regatta” home with him and his smile was as big as if he had won the actual race. It was a wonderful ending to a fabulous evening. This was the ninth annual and I think it was the best one yet. Certainly, it was the most crowded necessitating opening up a side-room-storage area and setting up several tables there. Auctioneer Bruce Peterson immediately dubbed it the “VIP Room” and hinted that next year it will include a hot tub – or was it a massage table? In true VIP fashion, the bidding was hot and heavy from that area, and the Wine Tasting Dinner for Six donated by the Shelburne Inn went for more than $1,000 to a man rumored to have a 6,000-bottle wine cellar in his South Carolina home. Wow! Our table was in the middle-ish on the north side of the big room. We had reserved it hoping to accommodate Nyel’s wheelchair. It was perfect! 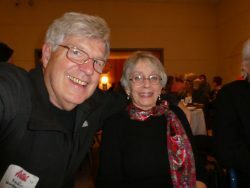 Bill and Sue Grennan, along with Tucker and Carol shared the table with us and I felt absolutely honored to be sitting next to the artist, himself! They always say “pride cometh before a fall,” but I don’t think taking pride in a friend’s accomplishments is quite the same. The whole evening was glorious – the art seemed better than ever, there were lots and lots of friends in attendance, the food and beverages were perfect, and the staff did everything so seamlessly, you’d think this was a daily activity. And, while the entire audience was full of quiet concern when “Security Guard” Richard Schroeder toppled over, even that event was handled smoothly. Dr. Weaver (whose wife is always a contributing artist) was in attendance, the EMTs came quickly and, as the audience clapped, Richard gave a wave from the gurney as he was carried out. The last we heard, he should be fine. 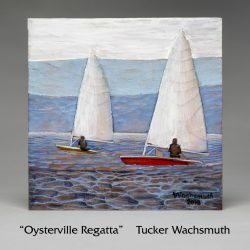 And thanks, Tucker, for giving Oysterville’s Regatta a solid place in the local art world. Can you hear us calling for “More! More!”?